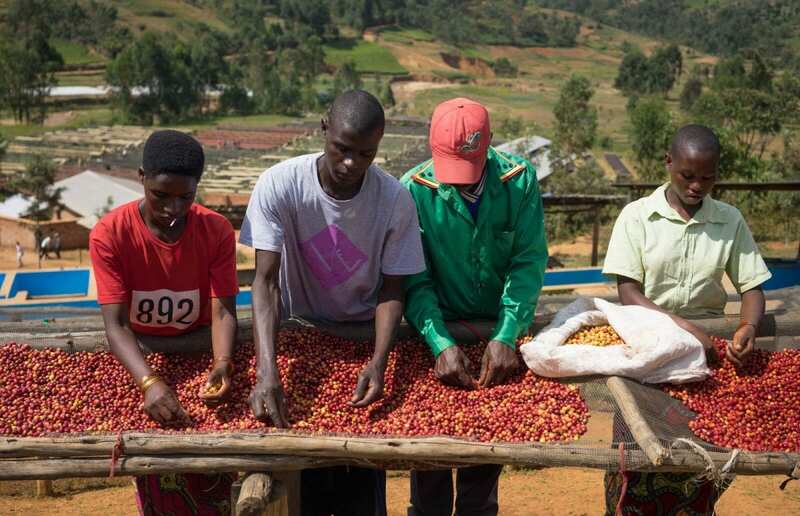 Landlocked, politically unstable and one of Africa’s smallest and poorest countries, it’s no secret that it can often be a struggle to get coffee out of Burundi. In fact this is the first year that we’ve roasted coffee from this origin so we are very excited to be able to offer this exceptional shade-dried lot from Mbrizi. The washing station at Mbrizi was established in 2014 by producer Salum Ramhadan who is dedicated to the training of local staff and hugely focused on quality. All cherries go through a strict program of selection and quality control after picking and are hand sorted for under-ripes and floated for over-ripes before they are entered into production. This particular lot has also been dried under shade instead of in full sun, a much longer process but one that gives the coffee more stability. Coffee farms in Burundi tend to be small, usually less than one hectare in size and with no more than 100 coffee trees. So several hundreds of farmers with smallholdings in the surrounding hills will contribute to the daily lots that come into Mbrizi washing station during the harvest between March and July.